Today marks the 149th anniversary of the Maryland Natural Resources Police, the oldest state police force and the nation’s fifth-oldest conservation law enforcement agency. 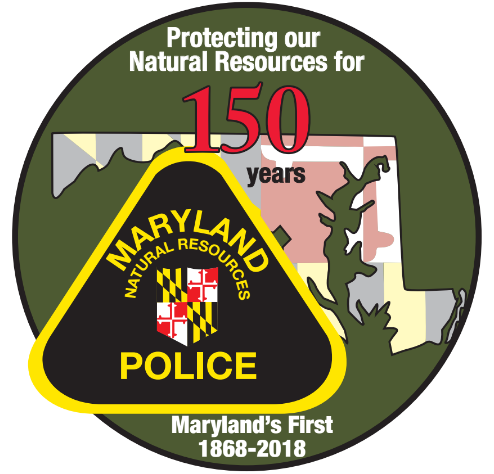 The day is being marked with the unveiling of the 150th anniversary badge, which may be worn by officers next year, and a “Maryland’s First” commemorative logo, which will soon adorn agency offices, vehicles and vessels. The 150th anniversary celebration next year will include a public open house, a historical publication and localized events tied to the agency’s offices. A cannon used during the earliest days of Natural Resources Police enforcement efforts, will be used in educational programs at area schools. Created by the General Assembly March 30, 1868, the State Oyster Police was charged with regulating the oyster industry and bringing order to the often lawless Chesapeake Bay, where pirates stole both oysters and goods. Hunter Davidson, a Naval Academy graduate and Civil War veteran, was named the first commander. In 1896, the legislature created the Office of the State Game Warden, led by Robert H. Gilbert of Baltimore. After decades of name changes and configurations, the fish, game and boating enforcement efforts were consolidated in 1971 under the name, the Maryland Natural Resources Police. Today, the police force, an authorized strength of 262 officers, is responsible for patrolling 470,000 acres of public lands, the Maryland portion of the Chesapeake Bay and its tributaries, the Atlantic Ocean coast and coastal bays and 9,000 miles of freshwater rivers and streams. Natural Resources Police aids boaters in distress, locates lost hikers and hunters and provides boating and hunting safety education.